‘The U-2 Incident & the Cold War’: PDM Lecture with Francis Gary Powers Jr.
Francis Gary Powers Jr., son of Francis Gary Powers, a U.S. Air Force pilot who was shot down over the Soviet Union in 1960, presented the lecture “The U-2 Incident and the Cold War” on Wednesday, Oct. 21, 2015, at the K-State Alumni Center. About 175 people attended, including members of the university and Fort Riley communities, as well as surrounding communities. In 2003, Powers Jr. wrote a book about the U-2 incident, “Operation Overflight: A Memoir of the U-2 Incident.” In addition to the lecture, the event included a book sale and signing beforehand, and a meet-and-greet and reception afterward. After his plane was shot down, Francis Gary Powers Sr. was held captive for two years in a Soviet prison. Powers Jr. spoke about his father’s experiences during that time. Shortly before the lecture, a Steven Spielberg film, “Bridge of Spies” starring Tom Hanks, was released in theaters nationwide. Powers Jr. served as a technical director to the film. 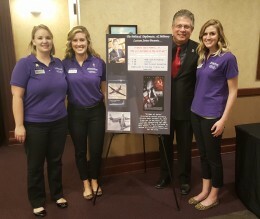 The Institute for the Health and Security of Military Families, K-State’s Office of Military and Veteran Affairs, and other local organizations, sponsored the lecture.